UPM Racing is an INSIA-UPM engineering students’ project. 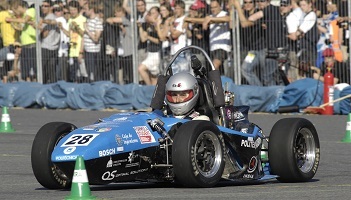 Every year, they design and manufacture two formula student vehicles (an electric one and an internal combustion engine one). Simple and economic manufacturing processes are required so that students can produce a high number of parts. In addition, they must produce them with the sufficient efficiency to achieve the best results. Weight is very important when designing the vehicle, so producing parts with resistant and low weight materials is crucial. Actually, carbon fiber tubes are manufactured with the wet lay-up technique, producing the two sides of the tube independently and combining them afterwards. UPM Racing is looking for a reliable, simple and cheap system for the craft manufacturing of epoxy carbon fiber tubes, using the wet lay-up technique. Help us and receive recognition through visibility and free tickets for attending the racing in your continent! Do you have design skills? Could you help us to find new solutions to craft manufacture epoxy carbon fiber tubes?